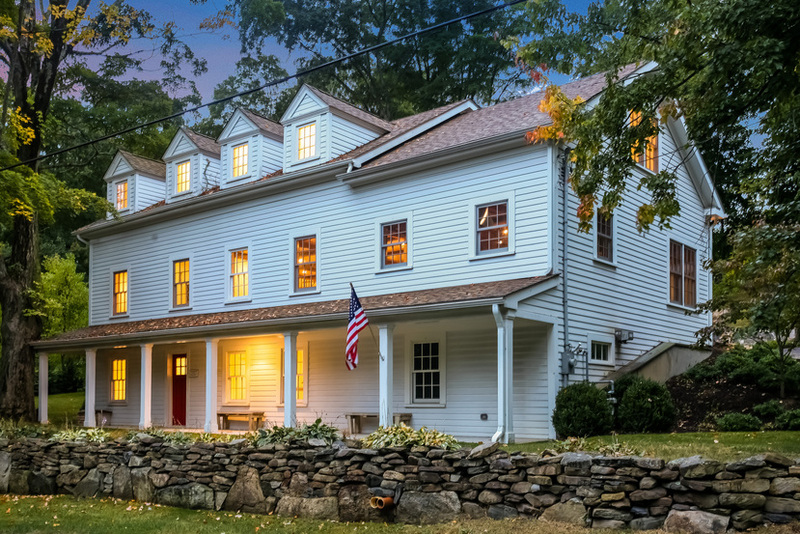 Totally renovated & expanded in 2009, 428 Quaker Rd is one of the original houses of Chappaqua. Original caretaker of The Quaker Meeting House, Thomas Dodge, cabinet maker, built his house in 1744. Totally renovated & expanded in 2009, it is one of the original houses of Chappaqua. Nestled in the Historic District, it is a short ride to Town, the Metro North Train & Saw Mill. Like Open Living Spaces? It begins in the exterior courtyard. Upon entering, there are large open spaces on the main floor, second floor & Master Suite. Wide board floors & beams are re purposed from a Wisconsin Barn from the 1700’s. Open Living/Dining area. Dramatic eat-in kitchen w/stainless & cherry wood cabinets. Black Zimbabwe granite counters. Garland Stove & Miele dishwasher. Stunning rustic walkway to the spacious Main Floor Master Suite & Bath w/Bain Ultra Chromotherapy bath. Second floor – there is a large open space flanked by two bedrooms and two baths. High ceilings, lots of windows & light! Taxes shown w/out Star of 1729.